Summer is a time to find your comfort zone and relax, but there's no sense in not getting weird sometimes. If you're too shy to go skinny dipping or try something off-the-wall, though, maybe trying a batch of different new music will do it for you. This month's edition of Bandcamping brings an eclectic variety of obscure albums we found on Bandcamp, so check out the albums below and let us know in the comments which ones are your favorite. If you're looking for something that's a bit "out there," then here you are. FREE MONEY is an often experimental effort that might lose a few listeners along the way, but those who stick around might find something that they're low-key into, like the oddly danceable title track, or the autotuned, didgeridoo-driven, and EDM-influenced "Intro." Yes, that's a mouthful, but it's also pretty neat. It's tough to stand out in hip-hop with so many Soundcloud rappers having access to FruityLoops and a USB microphone, but Sam U Él seems to have found a corner of his own. The New York artist's chicano- and soul-inspired hip-hop sound makes for some great vibes with engaging rhythms and satisfying bass, especially on songs like "El Cielo Freeway." This remaster of a 2012 recording from Dutch group unhappybirthday sounds like it was ripped out of the late 70s/early 80s new wave movement, and the throwback vibes are totally welcomed. Album standout "Himitsu" satisfyingly hearkens back to a time when bands were still figuring out electronics and combining them with propulsive post-punk rhythms. It's no novelty, though, because the songs themselves are for real. 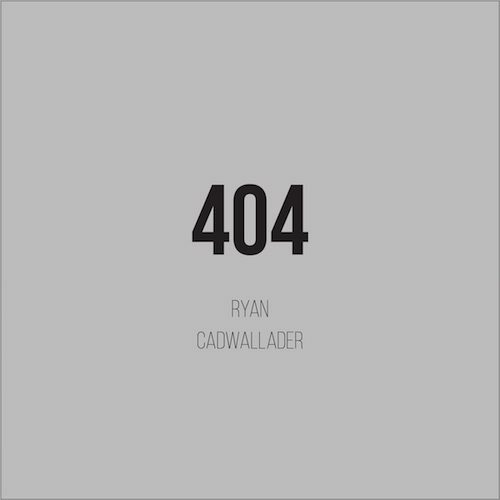 Canadian composer Ryan Cadwallader tries to meld a lot of different genres -- jazz, blues, hip-hop, R&B, ambient -- on this six-track effort, and one of its strengths is that it never falls squarely into any one of those genres. "Strut" is a soulful and funky effort, while "It'll Come Tomorrow" sounds like an ambient piano-driven number before breaking out into an instrumental hip-hop beat. 404 is a fine demonstration of a young songwriter's skills, and hopefully a peek at what's yet to come. Everything about Kentucky-based band Holy Machine is big-sounding: their reverb-drenched guitars that borrow from U2's The Unforgettable Fire era, their persistent krautrock and electronic drum beats, and their sometimes synthwave Stranger Things vibes. The cinematic album opener "Interview" establishes a sinister environment earlier, and frenetically paced tracks like "The Sailor's Fate" keep the promise of high-energy and headphone-filling atmospherics. This is a diverse winner that wows in more ways than one. That’s all for July, but until next time, let us know in the comments which of these albums were your favorites, what we missed, and what we should look forward to. If you missed out on June, check it out here (and the complete Bandcamping archives are here).